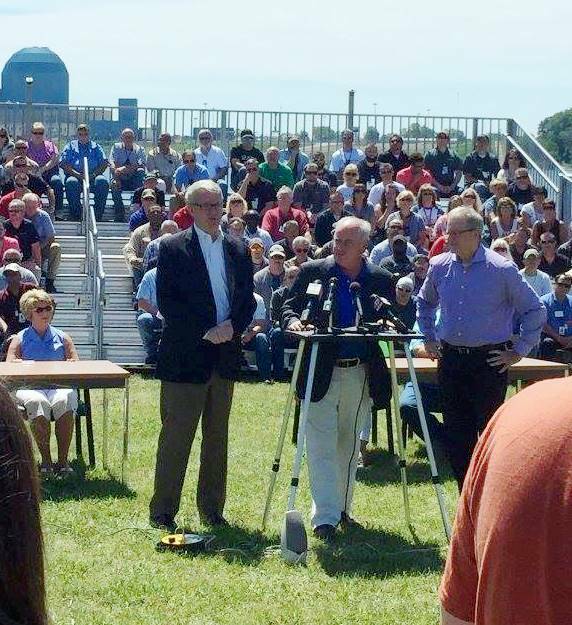 House Republican Leader Jim Durkin, along with State Representatives Bill Mitchell and Dan Brady, were in Clinton Friday to discuss efforts to save the Clinton Power Station. They were joined by more than 100 Exelon employees in support of keeping the plant open. Last month, Exelon announced its decision to close the Clinton Power Station, which provides 700 good-paying jobs and another 1,200 indirect jobs, and more than $13 million in local tax revenue to area schools and local governments. Meanwhile, negotiations continue on legislation that would place Illinois nuclear plants on a level playing field with renewables such as wind and solar, which are heavily subsidized by Illinois ratepayers. State Rep. Bill Mitchell (R-Forsyth), who represents Clinton and DeWitt County, thanked Leader Durkin for coming to Clinton to show his support for the community. “The Clinton facility is important to our local communities and to our families. We’re here today to show our solidarity with Exelon employees, and to let them know that we will be doing all we can to get this legislation called for a vote in the House,” said State Rep. Dan Brady (R-Normal).